Indian Head Massage has roots in the ancient Indian practice of medicine, called Ayurveda, based on balancing the body, mind and spirit to promote a long life. The tradition has been passed on in Indian families from one generation to the next. ‘Shiroabhyangam’ is the original name for the Indian head massage. ‘Shir’ means head, and ‘Abhyangam’ means oil application. Thus oil application on the head is called as ‘Shiroabhyangam’ in Sanskrit, a language in which the Ayurvedic classics were initially written, almost 5000 years ago. In its true sense, the Shiroabhyangam, is a complete massage of the head, neck and shoulders. Out of the three (Heart, Head, and Pelvic region including the excretory and reproductive systems) most important parts of the body, head is the foremost. Head consists of the brain which is the seat of consciousness. It also consists of all the sense organs through which we interact with the outer world. When Ayurveda and Yoga talk about the concept of rejuvenation they give importance to the functioning of the five senses as a constant part of our ageing process. When they talk about the importance of the daily routine cleansing and detoxifying procedures (Dinacharya), they mainly take into consideration the functioning of sense organs, which if taken care of regularly, makes you stay younger for a much longer time. According to Ayurveda the five elements i.e. Air; Fire, Water, Earth, and Space intermingle in a dynamic flux with each other to form the human body. The Air and Space element forms the Vata Dosha. (‘Dosha’ is something which is ready to go out of balance). The Earth and Water elements form the Kapha dosha, and Fire plus Water form the Pitta dosha. Each of these doshas are then subdivided into five different types, depending on their location and function in the human body. Indian Head Massage reaches all energy centres where tension accumulates. Easy to learn in one day (due to small classes) one to one tuition. No expensive chairs or oils required. 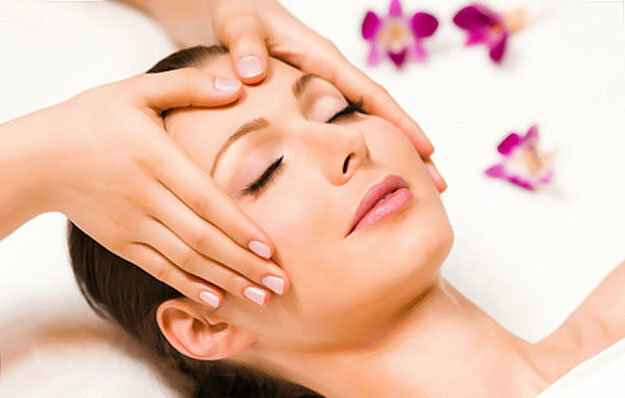 Indian Head Massage is the ultimate therapeutic and popular massage of the head, neck, shoulders & face. This traditional & effective massage is excellent for relieving stress and also promotes relaxation. With many benefits it is also great for general well being. At Allura you will enjoy the full experience! Your head, neck, face and shoulders will be massaged relieving stress, helping maintain balance in your life. Visit our Mississauga massage clinic to learn more about Indian head massage therapy. Or read about our other spa treatments.